Bollywood actress Deepika Padukone marked herself safe after the high-rise building in Mumbai she lives in caught fire on Wednesday. 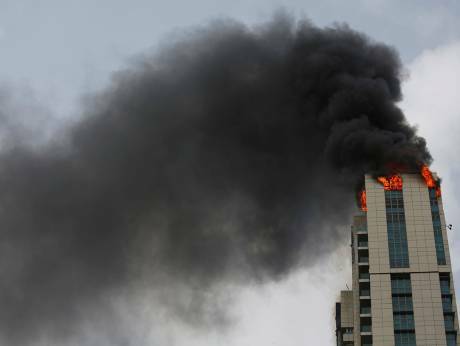 Fire erupted on the top two floors of the 34-storey apartment complex, in south Mumbai, this afternoon. Deepika, who lives on one floor of the complex and has an office on another, was not in the building when the fire began, according to reports in Indian media. More than two dozen fire-tenders, including sophisticated lifts and cranes, were deployed to fight the blaze. Police sources said over 90 residents of the apartment complex were safely evacuated. It is not clear what started the fire. Deepika Padukone last featured in ‘Padmaavat’ which released in January.